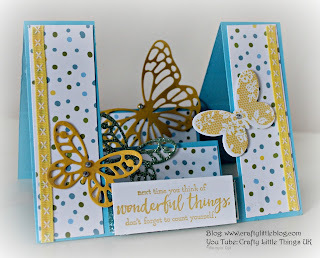 This gorgeous card is oozing with spring time vibes for me and I just love how it turned out, although it took some chopping and changing to get there as the tutorial video shows. You can see that by clicking here. I used a Tempting Turquoise base and added some DSP from Sweet Soiree I used a sentiment from Just Add Text and used Butterfly Basics to stamp out a butterfly image in Daffodil Delight. 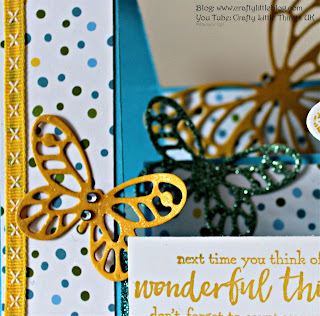 I used Bold Butterflies and Butterfly Framelits to cut out a couple of other butterflies and did a quick bit of magic on them with good old Wink of Stella. I used a little bit of Daffodil Delight double stitched ribbon and also a tiny piece of glimmer paper under the sentiment stamped on Whisper White using Daffodil Delight ink. I think the whole thing looks really bright and cute and it was all finished off with a couple of rhinestones to accent the butterflies. Hope this offers some inspiration and my next mini series is going to focus on Valentine's Day projects.